Guidance and advice to help make decisions on pay increases. 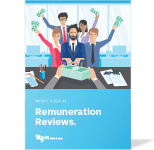 Remuneration reviews are one of the most costly HR processes businesses go through. They are also one of the most important, boosting motivation and performance, and improving employee retention. Pay parity within different roles.